Ambience has the power to uplift your mood. The middle of October to early November is the best time to view the beautiful autumn colors at Oirase Gorge and Lake Towada! Fall offers an excellent opportunity to see the area transformed from summer greenery to crimson and gold. In late November, the colors fade and are replaced with an austere yet majestic winter scenery. Travel the island of Honshu Japan to the far northern end, you will discover there are no limits to what this world will go to, just to give you ambience at it’s best and finest extremes. 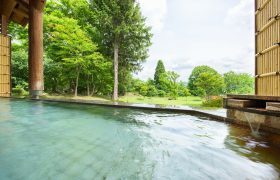 Lake Towada West Shore Hot Spring, a spa with true ambience, soothing, relaxing, refreshing and restoring. A few changes have been made in the last 55 years.